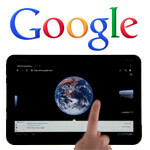 Google is at it again, enhancing the user experience of Image Search for owners of iPads and Android tablets. The new features mostly center on touch-based interaction. Users only need to touch a thumbnail to see a full-sized image, and swiping left or right takes you to the subsequent images. Information on the full-sized image is now displayed in a more tablet-friendly format as well. These updates build on other tablet-centric features introduced this summer, when Google increased the size of image previews, introduced continuous-scrolling thumbnails, and more rapid loading of thumbnails (which we imagine was needed to make continuous-scrolling a practical reality). The new features are available in over 40 languages, and are live right this moment, so point your fingers towards Google Image Search and try them out yourselves. As tablets continue to eat into the sales of traditional PCs, we should see many more optimizations of this sort for mobile touch-screen devices. One thing you gotta love about Google is they really are always improving. People love seeing the new updates and what they've come up with next.